Take notice that on November 21, 2014, Sabal Trail Transmission, LLC (Sabal Trail), 5400 Westheimer Court, Houston, TX 77056, filed an application under section 7(c) of the Natural Gas Act, requesting authorization to construct, own, and operate a new 500-mile natural gas pipeline system (Sabal Trail Project), including 209,900 horsepower at five compressor stations, metering and regulating stations, and appurtenant facilities in Alabama, Georgia, and Florida. Sabal Trail also requests a certificate of public convenience and necessity to acquire by lease from Transcontinental Gas Pipe Line Company, LLC (Transco) the incremental firm capacity that will be created by Transco’s proposed Hillabee Expansion Project (Docket No. CP15-16-000). Sabal Trail also requests a blanket certificate pursuant to Part 157, Subpart F of the Commission’s regulations, authorizing Sabal Trail to construct, operate, acquire and abandon certain facilities as described in Part 157, Subpart F, and a blanket certificate pursuant to Part 284, Subpart G of the Commission’s regulations, authorizing Sabal Trail to provide open-access firm and interruptible interstate natural gas transportation services on a self-implementing basis with pre-granted abandonment for such services, all as more fully set forth in the application which is on file with the Commission and open for public inspection. 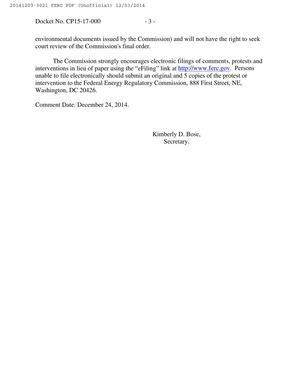 The filing may also be viewed on the web at http://www.ferc.gov using the “eLibrary” link. Enter the docket number excluding the last three digits in the docket number field to access the document. For assistance, please contact FERC at FERCOnlineSupport@ferc.gov or toll free at (866) 208-3676, or TTY, (202) 502-8659. Any questions regarding the proposed project should be directed to Lisa A. Connally, General Manager, Rates and Certificates, Sabal Trail Transmission, LLC, P.O. Box 1642, Houston, Texas 77251-1642, or by calling (713) 627-4102 (telephone) or email at laconnolly@spectraenergy.com. 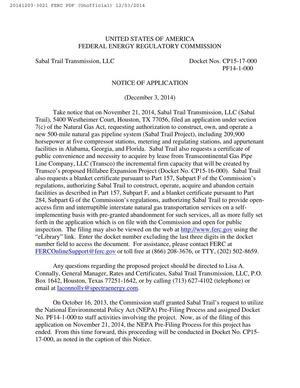 On October 16, 2013, the Commission staff granted Sabal Trail’s request to utilize the National Environmental Policy Act (NEPA) Pre-Filing Process and assigned Docket No. PF14-1-000 to staff activities involving the project. Now, as of the filing of this application on November 21, 2014, the NEPA Pre-Filing Process for this project has ended. From this time forward, this proceeding will be conducted in Docket No. CP15-17-000, as noted in the caption of this Notice. Because the environmental review of the Sabal Trail Project must also include both the Hillabee Expansion Project and Florida Southeast Connection LLC’s FSC Project (Docket No. CP14-554-000), preparation of the Environmental Impact Statement (EIS) to comply with the NEPA of 1969 will combine all three applications. 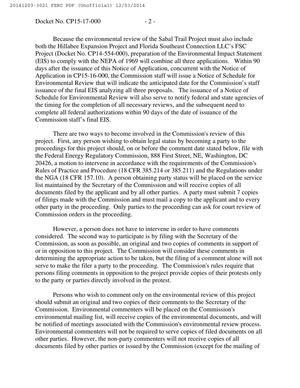 Within 90 days after the issuance of this Notice of Application, concurrent with the Notice of Application in CP15-16-000, the Commission staff will issue a Notice of Schedule for Environmental Review that will indicate the anticipated date for the Commission’s staff issuance of the final EIS analyzing all three proposals. The issuance of a Notice of Schedule for Environmental Review will also serve to notify federal and state agencies of the timing for the completion of all necessary reviews, and the subsequent need to complete all federal authorizations within 90 days of the date of issuance of the Commission staff’s final EIS. Comment Date: December 24, 2014.
swath through the country is a utopia of singing birds and contented wildlife. a 3 ft. pressurized pipe get buried a few feet down in sinkhole territory? The landscape of Florida is extremely vulnerable to any disruptions such as the Sabal Trail pipeline. Everything must be done to protect this unique environment. I stand against the pipeline in our area.